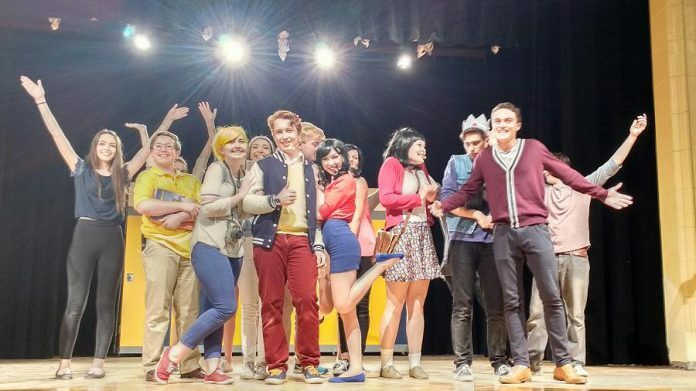 Beginning tonight (April 26), Enter Stage Right invites the audience to the world of Riverdale U.S.A. in their long-awaited premiere of Jen Nugent’s original musical Everybody Loves Archie. A brand new show featuring the iconic comic book characters that have been beloved by multiple generations of readers, Everybody Loves Archie brings to life Archie, Jughead, Betty, Veronica, Reggie, and the entire Riverdale gang. Like many people, I read Archie Comics when I was a kid, but for the past 15 years I have been actively collecting Archie books and collectables. From original art, to signed books, to a Veronica Lodge tattoo on my arm (seriously — stop me when you see me at a arts event and I’ll show it to you), it’s an understatement to say I know a lot about Archie Comics. And the timing couldn’t be more right for Everybody Loves Archie. Having just celebrated its 75th anniversary in publication, Archie Comics not only received a highly publicized reboot, but the new TV series Riverdale — which presents a dark and twisted take on Archie — has become a surprise hit for the CW network, despite being deemed controversial amongst fans. Archie is, once again, front and centre in the pop culture radar. However, unlike the TV series, Everybody Loves Archie brings back the colourful and fun version of Archie that we all know and love in a lively and family-friendly comedy. The plot is just as familiar as the characters themselves: filled with big personalities, romantic troubles, zany misunderstandings, and goofball hijinks. In a storyline ripped right out of the comic books, school is back in at Riverdale High, and Betty Cooper and Veronica Lodge are back to vying for Archie Andrew’s attention. However, finally sick of playing second fiddle to his good-natured foil, Reggie Mantle puts together a diabolical scheme to finally make Archie choose once and for all in the ultimate “Love Showdown”. Will he pick Betty or Veronica ….. or could it be someone else? I don’t want to spoil the fun, but long-time Archie fans already know where this is going — and it’s just as good as you want it to be. Writer and director Jen also introduces a second love triangle to the story featuring Jughead Jones, Ethel Muggs, and Dilton Doiley. As established in the comic books, Jughead has always been more interested in hamburgers than girls, and has been avoiding the overzealous affection of Ethel for decades. In a brand new twist to the long running one-sided love affair, Jen brings in Riverdale’s genius Dilton who, having spent time with Ethel over the summer, has developed feelings for her — which Ethel is too blind to see. Everyone else’s romantic pursuits are put on hold when the kids discover a story of unrequited love, and join forces to bring together a surprise couple at the annual Snowball Dance with the help of a “love potion” developed by Dilton. Of course, much in the fashion of a classic Archie comic, nothing goes as planned. I can’t even begin to express how the cast of Everybody Loves Archie manages to bring the characters from the original Archie Comics to life. All the actors understands the mind and motivations of each of their individual characters and recreate their personalities on the stage. Written and directed by Jen Nugent and produced by Greg Nugent. Stage manager Medihah Merchant. Featuring (in alphabetical order) Colton Beal, Thomas Bodrug, Alivia Buchan, Gabby Byzenko, Matt Campbell, Jaidan Charters, Sarah Daye, Amy Daye, Jordan de Groot, Ben Greene, Jacob Howran, Antje Kroes, Isaac Martin, Aiden McDonald, Robert McEwen, Samantha Pickard, Nicole Quinlan, Lindsay Rudkins, and Lauren Wilson. For more information on Enter Stage Right, visit enterstagerightptbo.weebly.com. Jacob Howran, with the production on his shoulders, becomes Archie Andrews. Friendly and welcoming, but also a bit goofy and oblivious to everything around him, Archie is your guide into the world of Riverdale. Although Jacob only had a few months to learn the role as a mid-production replacement, he embraces the role and is a believable Archie. But just as in the comics, it is Archie’s friends who are larger than life. Alivia Buchan brings to the stage the snobbish sophistication of Veronica Lodge, while Samantha Pickard is peppy and pretty (and potentially psycho) as girl-next-door Betty Cooper. In a spot-on performance, Matt Campbell plays the diabolical Reggie Mantle, who doesn’t understand why Archie gets all the girls, while Colton Beale brings the dumb, dangerous, but good-natured Moose Mason to life, accompanied by Antje Kroes as his long-suffering girlfriend Midge Klump. Issac Martin takes on the role of Dilton Doiley by reciting lines so complex with large words that if he threw a line or two I wouldn’t even notice. Finally, accompanying the main cast is Sarah Daye as Ginger Lopez, who is as adorable as the character she plays. As my absolute favourite of the Archie gang, it really was a joy for me to see Ginger given such large representation in the show. 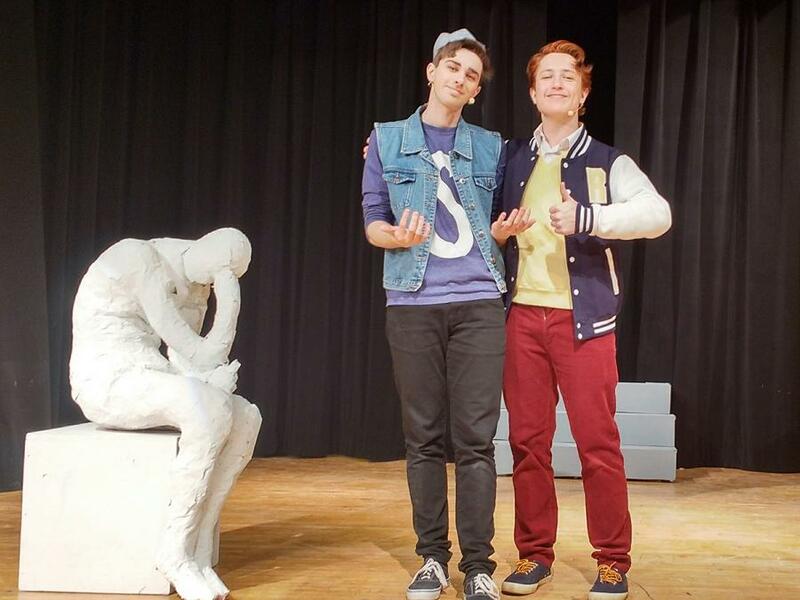 But while all the main characters get their stand-out moments, it’s Thomas Bodrug in the role of Jughead and Aiden McDonald as Ethel Muggs who are the scene stealers. I can’t express how incredible Thomas is as Jughead. 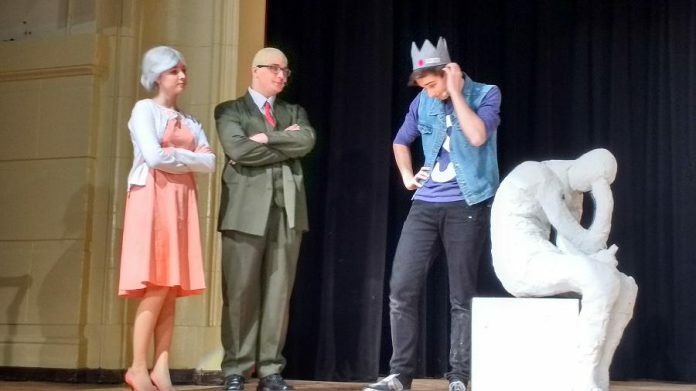 With his awkward movements, his cartoonish voice, and his eccentric aloofness, Thomas brings the enigma that is Jughead to life. It is a perfect performance. Meanwhile, Aiden gets most of the big laughs as Ethel. However, while Ethel’s original treatment in the comics was often cruel (she was portrayed as the “ugly girl”), in Everybody Loves Archie the comedy comes from Ethel being overzealous and trying much too hard, along with the wonderful cartoonish voice she creates for the character. Aiden also gets the musical moment of the night for her performance of the Temptation’s classic hit “Just My Imagination” which beautifully fits into the premise of her feelings for Jughead. I also want to give a shout-out to Amy Daye as Cheryl Blossom. I can’t say much without giving away a few of the great plot surprises, but what I will say is that she ignites the stage like a red-hot cherry bomb going nuclear, and nicely changes the course of the production upon her arrival. Both as a comic book collector as well as a die-hard Archie fan, what I love about Everybody Loves Archie is how the cast and crew have been able to bring the classic style of the comic book to life. The sets are bright and colourful, painted in Riverdale’s blue and gold colour scheme. The costumes and characterizations of the characters are dead on. When the principal characters come on the stage, there is no doubt who they are because they actually manage to look like the comic characters. 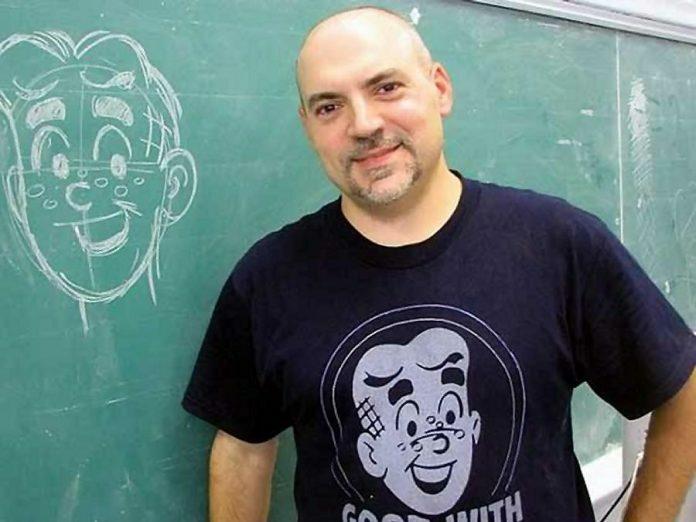 In fact, when I sent the publicity photos of the cast to comic book artist Fenando Ruiz, he responded on Facebook: “They look more like the real Archie than the cast of Riverdale does.” Fernando should know, because he drew the Archie characters for decades. While some of the actors, such as Thomas Bodrug as Jughead or Matt Campbell as Reggie, are the splitting image of their characters, other actors, such as Jacob Howan as Archie and Colton Beal as Moose, went so far as to dye their hair to get the look of the characters. Other cast members had to undergo wigs and heavy makeup to bring their characters to life. In reality, actress Alivia Buchan is a blonde, and Samantha Pickard is a brunette. But the pair, as well as a number of the other Riverdale girls, are put in wigs to bring their Riverdale counterparts to life. While Alivia looks flawless in a dark wig to become Veronica, Samantha’s blonde wig is an outrageous yellow to become Betty. But the aesthetic works perfectly, making Samantha into a living embodiment of the comic character. Lindsay Rudkins and Robert McEwen are beautifully transformed from young actors to middle-aged teachers in the roles of Ms. Grundy and Mr. Weatherbee, while the pretty Aiden McDonald is transformed into the garish (yet still sort of cute) Ethel. From Ginger Lopez’s white streaks, to Midge Klump’s short hairdo, the cast looks just right. What even impressed me more was the attention to detail put into some of the lesser-known background characters. 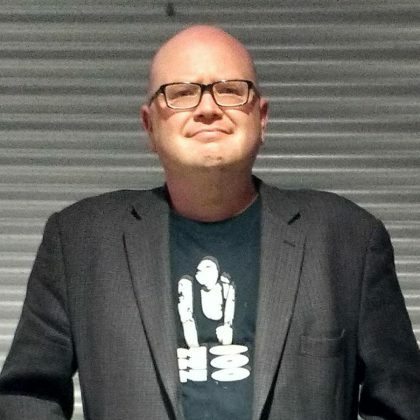 The costume that impressed me the most was that of Gabby Byzenko, who plays Archie character Ambrose Pipps (not to be confused for Sabrina the Teenage Witch’s cousin Ambrose Spellman). 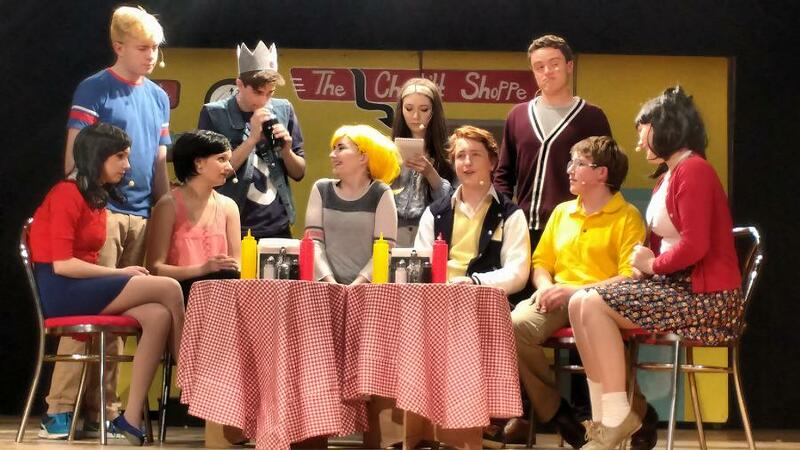 Although an obscure Archie character, Gabby has the look of the character right, which really brought a sense of authenticity to this production. 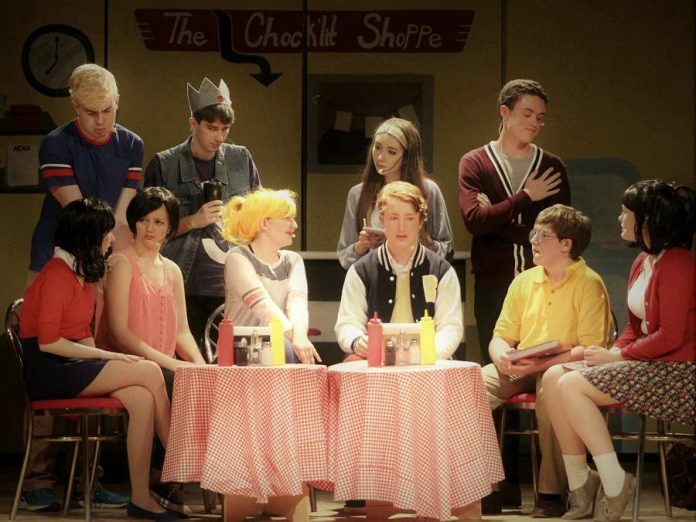 Everybody Loves Archie also features some other lesser-known fan favourites such as Cricket O’Dell (Jordan de Groot), Adam Chisholm (Ben Greene), Cora Jones (Nicole Quinlan), Marcy McDermott (Lauren Wilson) and Brigette Rielly (Jaidan Charters) which expands the world of Riverdale even further. Although some of these characters may not be familiar to everybody, to hard-core Archie readers like me, the inclusion of these characters shows that Jen Nugent really did her homework. Musically, Everybody Loves Archie is a bit all over the place, featuring classic pop numbers from the early to mid 1960s, often rewritten to go along with the characters and plots. When the cast brings it on, they really bring it on. Some of the vocalists, including Aiden McDonald, Lindsay Rudkins, and Issac Martin, are very good, while the dance sequences and large production numbers are ambitious and fun. It was so great seeing the gang dance in Pop’s Chock’lit Shoppe that I almost wanted to join in (although that would have probably been awkward for all involved). A piece of advice: although not the fault by any means of the company, the sound system at PCVS is ancient and the sound could possibly be an issue despite everybody’s best efforts. Make sure to come to the show early and get a seat as close to the stage as possible so you can hear the entire production, in case sound continues to be an issue come opening night. 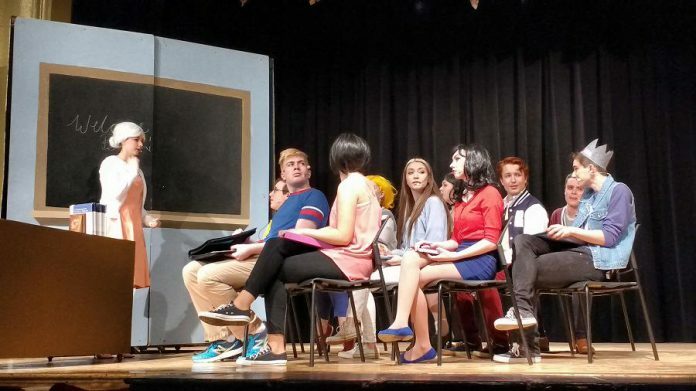 There is so much to love about Everybody Loves Archie, but what I loved the most is that this show brings to the stage everything I love about the Archie Comics and what it is that makes me a fan. The familiar characters, the colourful costumes and sets, and the classic storylines are brought together with an energetic and likeable cast that’s the same age as the characters they represent (with the obvious exceptions of Mr. Weatherbee and Miss Grundy). It’s funny, good natured and friendly, unlike some of the more recent takes on Archie. Everybody Loves Archie embraces the Archie Comics I love (although there was at least one Riverdale inspired joke that even I had to laugh at, in spite of myself). The cast and crew of Enter Stage Right have put together something to be proud of. There is a lot of theatre opening this week, but what Everybody Loves Archie offers is something really light and fun. I smiled so much watching it that my face still hurts a day later. 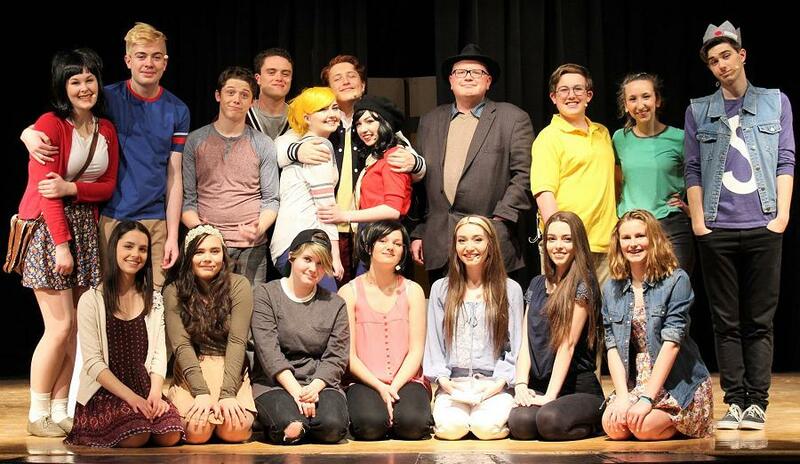 Everybody Loves Archie opens on Wednesday April 26th, and runs until Saturday April 29th at the PCVS Auditorium. Shows start at 7 p.m. and tickets are $15 at the door ($10 for seniors and students).